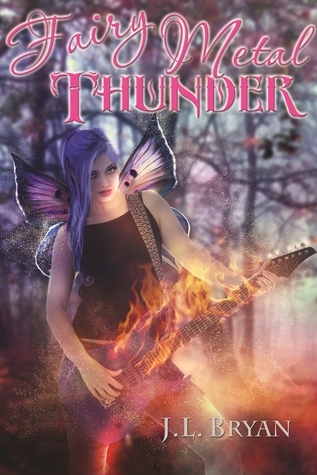 Thanks to the author, I have an excerpt and copy of Fairy Metal Thunder to giveaway today! Fairy Metal Thunder (Songs of Magic #1)by J.L. Bryan. Publication : Published September 16th 2011. Jason plays guitar in a teenage garage band called the Assorted Zebras, but they have no fans, no gigs, and they're going nowhere. Even worse, Jason has a crush on the lead singer, but she already has a near-perfect boyfriend. Saturday night, Jason sat at home in his living room, his guitar in his lap, trying to pick out the music for “Angel Sky,” the song he'd written for Erin. He was having trouble getting the music and lyrics to flow together. His mother had dragged his father to a collectible ceramics convention in Minneapolis, an hour away, and they still weren't back. “Jason?” Katie asked. His little sister stood in the doorway of the living room in her Bert and Ernie pajamas. “Um...” She fidgeted, looking nervous. “But I could be next!” Katie looked terrified. “Thanks, Jason.” She took his hand as he walked toward the steps, something she hadn't done in a couple of years. She really was frightened. They walked upstairs and to the end of the short hall in their split-level house. Katie stayed back, clinging to the frame of her bedroom door, while Jason approached the master bedroom. “He just went puff,” Katie said. “He went puff, huh?” Jason said. He had no idea what that meant, but Katie had a very busy imagination. But Jason had seen something. He looked again. There it was—a small creature, about two feet high, standing on his parents' dresser. It looked like a tiny person, dressed in a ratty, dirty wool overcoat, with a woolen cap pulled low over its eyes. Its pudgy green hands pawed through his mother's jewelry box. Jason watched the creature drop a pair of ruby earrings into a pocket of its coat. The little creature jumped and spun around to face him. Its face was green and ugly, with an underbite, its eyes big and yellow under the low bill of the cap. “What are you?” Jason asked. The thing growled a little, then disappeared in a puff of green smoke. It reappeared in the space in front of the dresser, near the bottom drawer, and landed on its feet, which were clad in small, badly cracked leather shoes. It ran across the carpet to the window. It disappeared in another green puff, then reappeared standing on the windowsill. The little creature stuck out its dark green tongue at Jason, then disappeared with another puff of smoke. It reappeared on the little ledge outside the window, waved at Jason with a smile full of yellow, crooked teeth, and then hopped out of sight. “Hey!” Jason ran to the window and opened it. He saw the creature blink in and out of visibility as it tumbled to the back yard, leaving a trail of green smoke fading in the air. Jason hurried out of his parents' room, past Katie, who was crouching behind her door, poking out her head. “Did you see the monster?” she whispered. Katie stepped out of her room and walked to the top stair. “But I want to come with!” Katie crossed her arms and pouted. Jason ran through the living room and out onto their concrete slab of a patio. He saw the little green man trampling through a flower bed at the edge of the yard. The creature reached the neighbor's split-rail fence and puffed through it. Jason raced to the fence and leaped over. When his shoes hit the ground, the creature turned its green face to look back at him, snarled, and put on speed. It puffed in and out of sight, jumping forward about a foot each time. Jason hurried to keep up as the creature shot forward across his neighbor's lawns. The little thing could move fast, but Jason had much longer legs than it did, and he gained on the creature. He was determined to catch it, and not just to recover his mother's stolen earrings. If this little monster was the one who'd been stealing jewelry all over town, then it might have Erin's necklace, too. Jason could already imagine how happy Erin would be when Jason returned it to her. He chased the creature into Mrs. Gottfried's yard, which was full of toy windmills and fake plastic birds. Jason caught up with it and reached one hand down to grab the creature by the scruff of its neck. Then the creature disappeared in another green puff, and Jason realized too late that the little monster had led him directly toward a low stone bench. Jason was running too fast to stop. His shins cracked into the bench, and Jason spilled forward, falling among a family of plastic ducks. Ahead of him, the little creature turned and laughed, revealing its crooked yellow teeth again. Its laughter sounded like a hyena. By the time Jason scrambled to his feet, the green creature was across Mrs. Gottfried's lawn and puffing its way across the main road outside Jason's neighborhood. Jason chased him through three more neighborhoods, activating motion-detector lights here and there when he came too close to a house. The little green guy seemed to have no effect on the motion detectors—they only clicked to life when Jason passed. Then Jason chased him down an overgrown trail through the woods. The green creature reached a brick wall ahead, stuck its tongue out at Jason while waving the stolen earrings, then vanished in a puff of smoke. Jason reached the wall and slapped his hands uselessly against it. The wall was ten feet high, covered in moss and mold. Jason realized it was the wall around Mrs. Dullahan's yard. “Come back here!” Jason yelled. He thought he heard a hyena-ish giggle on the other side. Jason picked one of the tall old trees next to the wall and climbed it as quickly as he could. He scrambled out on a thick limb over the wall, struggling to catch his breath. He'd been running nonstop. Below him, the deep black shadows of Mrs. Dullahan's yard were scarcely pierced by the thin moonlight. It was inhabited by big old oak trees, almost as dense as a forest. The few patches of ground he could see were overgrown with tall weeds as thick as bamboo, and for a moment he was just glad he didn't have to mow her yard for her. Then Jason saw a streak of weeds ripple, as if a rabbit were dashing between them. He didn't have time to find a safe way down. Jason held his breath and dropped from the limb into the darkness below. Something hard and wooden, the size of a shoebox, crunched under his ribs as he slammed into the ground. Jason rolled up to his feet and looked at his aching side. He'd landed on what looked like a carved wooden squirrel, its mouth and eyes wide with fright. The fearful expression was heightened by that face that Jason had just broken its head from its body. Looking around, his eyes adjusting to the shadows and moonlight, he saw more little wooden creatures—toads and rabbits and even a full-size deer. A wooden owl perched on a limb overhead. All around him, little paths paved with moss twisted through the high weeds. The paths snaked across the yard, curving across each other at little intersections. Each path ended at one of the giant old trees, at ornate little doors no more than a foot or two high, which appeared to be built into the tree trunks. He saw the little green creature scurry through an arched green door in a dark elm tree. It pulled the door most of the way shut. Jason jumped after him, grabbing the tiny knob just before the door closed. The brass doorknob was the size of a child's marble in his fingers. “Hey, come back!” Jason yelled. He pulled the door open, but the little green creature was nowhere in sight. The interior of the tree was hollow. A series of roots formed a kind of staircase that spiraled down below the tree, out of sight. “You're kidding,” Jason said. He looked up at the dark shape of Mrs. Dullahan's house against the night sky. Maybe she wasn't a witch, but there was definitely something strange going on at her place. Jason stuck his head into the open door. He looked up, into the hollow shaft of the tree, but it was completely dark. Below, around the bend of the root-steps, he saw the slight glow of distant light. He could hear the faintest hint of music, and smell traces of wet, blossoming flowers and baking bread in the air. He put his hands inside the tree and crept forward as far as he could. He scrunched his shoulders and squeezed deeper inside, looking a little further around the curve. Somehow, he was able to fit even more of himself through the door, as if it expanded slightly for him. He crawled further down and around the root-and-dirt staircase, worried that the little green creature might pop out and hit him, or maybe bite him in the nose, but he was too curious to stop now. The curving space seemed to widen even more as he crawled forward, so he could let his shoulders relax and spread out. He crawled down another twist of the steps, and then he was completely inside the tree. The stairwell grew even wider as he moved forward on his hands and knees. The walls were made of packed dirt and more tree roots, and a few fireflies provided some light along the way. These fireflies were much larger and brighter than any he'd seen before, and their light was red and orange. He crawled around and around, and soon the stairwell was wide enough for him to stand, though he had to almost double over, his back brushing against the ceiling. He followed it down and down, around and around. Had it been a staircase in a building, he would have descended five or six stories by now. He kept going. Finally, after hundreds of steps, he reached a door. He seemed to be standing inside the round shaft of the tree trunk, though he should have been deep underground now, far below the roots of the elm tree. Golden sap dripped along the heartwood walls. His hands were covered in the sticky stuff, and probably his shirt, which felt glued to his back. The door in front of him looked just like the green arched door he'd entered above, except much larger. He would still have to duck his head to pass through it, but he wouldn't need to crawl. Jason touched the brass doorknob, and then he hesitated. None of this made any sense. How could there be such a long staircase under the tree? And where could this door possibly lead? Was he going to be attacked by a bunch of angry little green creatures on the other side? Then he remembered his purpose—recover Erin's necklace, and his mom's earrings, from the little green creature, who was probably still running away from him. Jason took a deep breath and pushed open the little door. The door opened onto a cobblestone road curving through a dark forest. A number of the trees beside the road had little doors built into them. Jason turned and saw that he'd just emerged from a tree himself. He looked up along the trunk and saw it branched out into little limbs overhead, like a normal tree. Impossible. How could it be connected to the tree in Mrs. Dullahan's yard? It was nighttime, but the forest was illuminated by swarms of fireflies, which glowed in a bright spectrum of winking colors—shimmering gold, fire-red, sunset orange. He stepped onto the road, and a wooden cart came clattering around the bend. It was drawn by a pair of shaggy blue goats, and driven by what looked like a small girl with long sapphire blue hair that streamed out behind her like a cape. “Out of the way, road-troll!” she shouted, and Jason scrambled back off the road. As she rocketed past, he thought he saw a pair of waxy, gossamer wings protruding from her shoulder blades. Little glass bottles full of frothy blue milk gleamed in the cart behind her, packed into place with golden hay. Jason watched her clatter away around the next bend. She passed a low figure in a ratty woolen coat and hat, who strolled along the side of the road. It looked exactly like the little green man Jason had been chasing, only it was three or four feet tall now. Clearly, the creature believed it had escaped Jason. It was even whistling while it walked. Jason ran up behind it. The creature heard his footsteps and looked back with a smirk, but then it gasped and its yellow eyes widened when it saw Jason. The creature lowered his head and began to run. “Stop!” Jason yelled. He grabbed the creature's arm, turned it around to face him, and then lifted it up by its shoulders. “Where are we?” Jason asked. “And the necklace,” Jason said. “The ancestral homeland of goblins!” The little creature looked at him indignantly. “You're a goblin?” Jason asked. The goblin held out a silver, heart-shaped locket. “I want that necklace,” Jason said. “You're not getting away from me,” Jason said. The goblin sighed and slumped his shoulders. He looked ahead on the road, in the direction where he'd been walking. “Annwn. Tïr na nǑg. Faerie. Am I jingling anything loose yet?” the goblin asked. “More than you know,” the goblin said. He began walking, and Jason stayed close beside him in case he tried to run. The road led them to a great mound of a city, where the buildings were made of stone and live trees with sprawling roots and limbs. The city was arranged in terraces rising up the hillside. High above them, the top of the hill was encircled by a towering wall built of golden hexagonal bricks. “What's that?” Jason asked, pointing to the huge wall. They walked under a high stone archway carved with the images of flowers and animals. As they stepped into the city, the cobblestone road beneath their feet turned into a street of brightly colored crushed pebbles. Big swarms of fireflies lit up the city in red, golds, oranges, blues and purples. The stone and living-tree buildings all had round, curving shapes—he didn't see a square corner or a straight line anywhere. Though it was nighttime, the fairy creatures crowded the city streets, and Jason saw long pastel hair and colorful transparent wings everywhere he looked. The fairies were selling flowers, jewels, rugs, shoes, pottery...all of it strangely small, designed for these people who stood no more than three to four feet high. Cheerful music played everywhere, strings and flutes and bells. Winner gets a paperback copy if he/she lives within the United States. International winner gets an e-book copy. Winner has 48 hours to respond or a new one will be chosen. I definitely love such stories. I've always been fascinated by fairies and different possibilities that stories with and about them provide. I totally love 'em. Once I start reading fairy books, You won't see me move even an inch for hours. Wings, Wicked Lovely, etc. Love faerie stories. So much fun! I love stories with Fae in them! I have loved faerie stories since I was a little girl. I think that's why I love them still. It's hard for me to think of them as negative forces/figures, however. I always relate them with sparkles and happy things -- little girl things, and they aren't always portrayed that way! I'm having to rethink my images and beliefs of them. I haven't really read many books with fairies so I don't really love them or hate them. The few I've read have been good. I find them interesting. I haven't encountered many fairies, though I read quite a bit of paranormal books so it's be nice to see how they live and act. I always grew up with fairies being the beautiful kind creatures that I just can't see it any other way! I don't like to read about evil ones unless the good ones prevail.